"Leslie Whittemore, Westbrook College, Class of 1977"
Westbrook College student Leslie Whittemore, Class of 1977, was a Dental Hygiene major and lived in Ginn Hall. For her senior class candid photo, which appeared in the 1977 Tower Yearbook, she wore dark slacks and a long sleeve, white blouse. Her dark hair was long, parted in the middle and pulled to the back of her head. 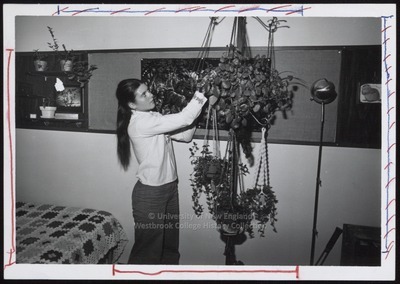 Leslie poses in her dormitory room facing a plant stand with several hanging plants held in handcrafted macrame slings. The corner of her bed is visible, covered with a colorful, crocheted afghan. A burlap bulletin board displays artwork.